There are a few questions still to be answered about William Johnson’s early life. 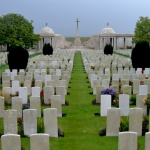 According to the casualty records of the War Graves Commission, William Johnson, Private 4311 of the 2/1st Buckinghamshire Battalion, was 23 when he died in July 1916. This would put his birth date around 1893. However, when he married in 1913, his age was listed on his marriage certificate as 23, giving a birth date around 1890. They can’t both be right. The birth records don’t help. Soldiers Died in the Great War recorded William’s birthplace as Hungerford but there were two William Johnsons born in Hungerford in the time span; William Frank Johnson in 1893 and William Edward Johnson in 1890. We don’t know anything more about William Frank Johnson born 1893 as he has yet to be found on any subsequent census records, but William Edward Johnson, born 1890, was the son of Charles and Matilda Johnson. (Matilda died in 1903.) By 1911, this William was working as a carter, boarding with the Townsends at Tidmarsh, north-west of Reading. On Ancestry, the genealogical website, many researchers list this William as Private 4311, despite the age discrepancy in the military records. The likelihood of this being the right man is further suggested, but not confirmed, by William’s marriage certificate to Maud Swadling which lists his father as Charles Johnson and his father’s profession as carter. It was not uncommon for a son to follow in the same occupation as his father. Another soldier, Frank Johnson, the son of Frank and Lucy Johnson, is also remembered on Datchet’s War Memorial. He too was born in Hungerford and later lived in Datchet. A family link, if any, has yet to be established. William married Florence Maud Swadling on 24 March 1913 at the Parish Church of Waltham St Lawrence. On the marriage certificate, recorded in Maidenhead, William was listed as a 23-year-old labourer, resident at Shurlock Row. Florence Maud was also 23, and also living at Shurlock Row. Her father, Frederick Swadling, was a cowman. In 1901 the Swadlings were living at Remenham. In 1911, they were at Cold Harbour Farm, Henley-on-Thames. 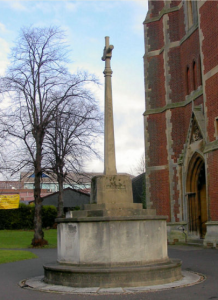 Maud’s sister, Lucy Margaret Swadling, married another soldier who is remembered on Datchet’s war memorial, Walter Sanford from Huntingdonshire, which is where her mother came from. Frederick and Herbert Swadling, their brothers, both served in WWI and are listed on Datchet’s War Roll. The Swadling family home, in 1917, according to Datchet Parish Magazine, was 2 Stanley Place. Before the war, William and Maud must have lived for a time in Langley, at 8 Alma Place, (William is also remembered at St Mary’s, Slough) but Maud seems to have moved back to her family home in Stanley Place, Datchet, when William left to fight at the Front. William enlisted in Aylesbury and became Private 4311 in the 2/1st Bucks Battalion of the OBLI (Oxfordshire and Buckinghamshire Light Infantry), known as The Light Bobs. The 2/1st Buckinghamshire Battalion was formed in Aylesbury in September 1914 as a second-line unit. In January 1915 they moved to Northampton and were attached to 184th Brigade in 61st (2nd South Midland) Division. They then moved to the Chelmsford area, first to Writtle and then on to Broomfield in April 1915. In January 1916 they moved to Parkhouse Camp, Salisbury Plain and in May 1916 they were mobilised for war and landed at Le Havre. They were engaged in various actions on the Western Front including The Attack at Fromelles, 19-20 July 1916. This was an unsuccessful diversionary tactic during the Battle of the Somme. William was killed in action during this attack, age 23 or 26, on 19 July 1916. “11am: ‘Zero’ was at 11am and at that hour our Bombardment started. “5.30pm: By 5.30pm we had lost nearly 100 men killed and wounded by shell fire. This was serious as on 18 July, A Company, which was holding the battalion front, had lost 78 men, gassed – owing to one of our own shells having burst a gas cylinder in our trenches. “The Battalion went into action with 20 Officers and 622 Other Ranks. This was reduced by casualties suffered during the action to 6 Officers and 300 O.R. “5.40pm: What was left of A and D Companies (the assaulting Companies) – about 120 men – filed out into No Man’s Land and lay down in four waves. “6pm: With a cheer, the four waves leapt up and assaulted the enemy’s trenches. “Even before 5.40pm the enemy’s machine guns had become busy, and at 6.00 pm they mowed down our advancing waves, so that only a few men actually reached the German parapet, and none of these ever returned. “Quite early (about 1.00 pm) telephone communication between Battalion HQ and the front line had been cut. After many gallant attempts to mend the wire, success was attained at exactly 5.40pm, and from then until 9.30pm the telephone was in constant use thus saving many lives, in that runners were spared. “Reports that flowed in over the telephone were sent on, as they came in, straight to Brigade HQ, and were very contradictory. Owing to the distance between the trenches, and to the continuous bombardment and smoke, the officers who were observing found their task almost impossible to fulfil with any degree of accuracy. “Our men had been seen actually on the German parapet so it was concluded that a certain number must have got in. But it is certain that very few survived the enemy’s machine gun fire, and whether they got in or not, they never returned. “C Company (which carried over Royal Engineers’ material for consolidation purposes) went out into No Man’s Land at 6.10pm but again the enemy’s machine gun fire prevented any advance without extermination. “6.30pm: By 6.30pm it was clear, firstly, the attack could not succeed without more men; and secondly, that given more men, say two Companies, the attack must have succeeded. No reserves, however, were available and the Commanding Officer of the battalion was ordered to reorganise and to attack again at 8.30pm. “This order was received at a time when every man, save a few Telephone Operators, orderlies and wounded, was in No Man’s Land. Gradually about 80 men (of A, C and D Companies) were reorganised, and 40 men of B Company (the Reserve Company) were added. “7.30pm: The order then came to postpone the attack until 9pm. “8pm: The order came through that no further attack would take place that night. “Every Officer who went out with the assaulting Companies was either killed or wounded except Captain H S G Buckmaster who was the only officer who went out into No Man’s Land and came back unhurt. “During 18-19 July the battalion lost 322 All Ranks (Officers: 4 killed, 8 wounded, 2 missing, 1 died of wounds; other ranks, 62 killed, 180 wounded, 65 missing). “The whole attack was unsuccessful in that the enemy’s trenches – though penetrated– were not consolidated and held. William Johnson is remembered at Loos Memorial, Pas de Calais, panel 83-85. 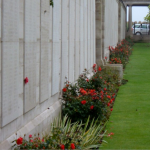 The Loos Memorial commemorates over 20,000 officers and men who have no known grave, who fell in the area from the River Lys to the old southern boundary of the First Army, east and west of Grenay. On either side of the cemetery is a wall 15 feet high, to which are fixed tablets on which are carved the names of those commemorated. At the back are four small circular courts, open to the sky, in which the lines of tablets are continued, and between these courts are three semicircular walls or apses, two of which carry tablets, while on the centre apse is erected the Cross of Sacrifice. William was awarded the Victory and British War medals. The contact address given for Maud in the Commonwealth War Grave Commission records was 3 East Cottage, Datchet. William is remembered on the War Memorial on Datchet village green and also at St Mary’s Slough.